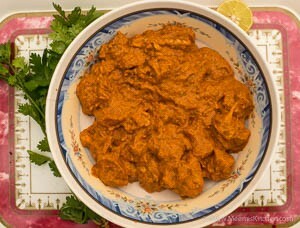 Chicken 65 is a popular starter/ entrée served in the Southern part of India. All over the world, appetizers/ starters play an important role as they kick start the dinner or lunch and they remain the favorite food for kids than the main course. Chicken 65 has been a favorite starter for my kids and I have worked out several modifications to arrive at this recipe. This has been an instant hit with my kids and guests and is a much sought after recipe. A good Chicken 65 should be crispy outside and juicy inside. Follow the recipe step by step and check the tips to attain the best results. The steps are quite easy to follow and the taste is just heavenly. There are several stories related to its name. One claim is that the chicken is cut into 65 small pieces, another claim is there are 65 ingredients used (I counted the possibilities, couldn’t agree), and yet another story is that 65 chilies are used per kilogram of chicken.. Whatever it is, the Chicken 65 is a fabulous starter enjoyed by kids and adults. Starters/ Appetizers should be light and not filling and should get your taste bud’s attention. Chicken cutlets, Fish cutlets, Cheesy Potato croquettes, Crispy fried Squid rings, Crispy strips, Chicken Kebab, Gobi Manchurian etc. are all great starters and does not spoil your appetite. You may also like my Grilled Tandoori Chicken, Sausage dinner rolls, Stuffed Garlic Bread etc.. So, make your evenings special with this yummy chicken 65 recipe! Small Onion : 5-6 nos. Cut the chicken (tender chicken is best) into very small pieces. 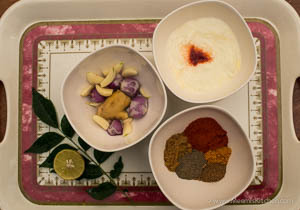 Grind the onion, garlic, ginger, curry leaves, all spices and masala. Add this masala to curd, and mix well with little food color and lemon juice and salt. Marinate the chicken pieces with this and cover and refrigerate for about 2 – 3 hours or more. Keep the chicken outside just half an hour before frying. Mix maida, rice flour, cornflour and salt and add this to the marinated chicken pieces and fry in oil. If the batter is too thick, add one egg white to the mix. Make sure the flame is on high when you put the chicken pieces and drain. Reduce flame while it is cooking. Once it is well fried drain and keep. Repeat the process. Lastly add some curry leaves and green chilies to the oil, fry and crush and top the chicken pieces. Serve with Onions and Lemon. I have added some red food color to make it more appealing and colorful. However, if your kids are allergic to colors, you may avoid it. You may add a small pinch of baking soda to the batter if you want a lighter covering. Add one eggwhite to the batter before frying, if the batter is too thick. You can add vinegar if you don’t have lemon. Flour should be added just before frying to make it crispy. 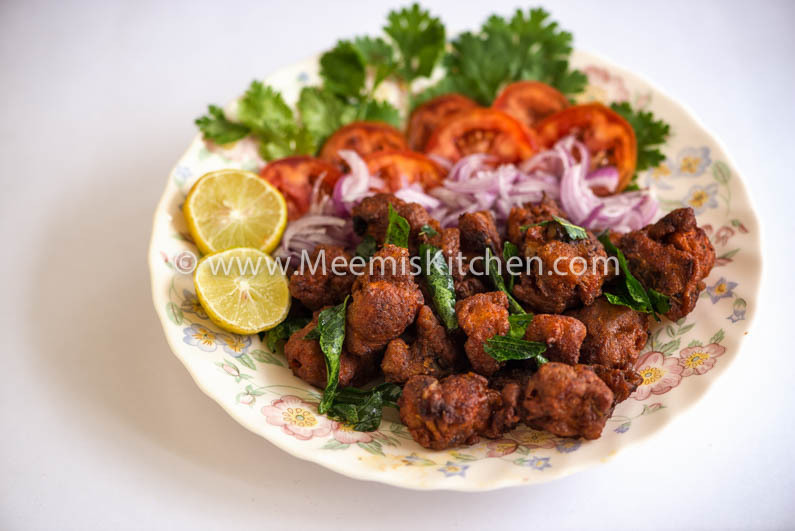 Enjoy the delicious crispy Chicken 65 Special @ Meemiskitchen and let me know how you liked it. God Bless! !